After it was registered in 2001, the Livecasino.com domain sold for $10251 in just five years. Now, depending on the website value calculator, the site’s valuation can range from $2000 to as much as $39000. And with the growing popularity of online casino gaming (particularly live casinos), we can always assume that the value for this domain will only increase over time. With that said, how has the domain fared since it’s initial registration almost two decades ago? Also, are there any websites like it that have managed to sell at similar or even greater valuations? Data prior to Livecasino.com’s purchase in 2006 are rather sparse. The Wayback Machine was able to get snapshots of what the site looked like when it first went online back in 2001 up until the year of its purchase. Interestingly enough, the domain actually started out as NevadaCasino.com and functioned largely as a casino gaming portal that featured links to a large number of other online casinos (like most Web 1.0 websites of that time). The site continued in this manner up until late 2003 when its registration expired. 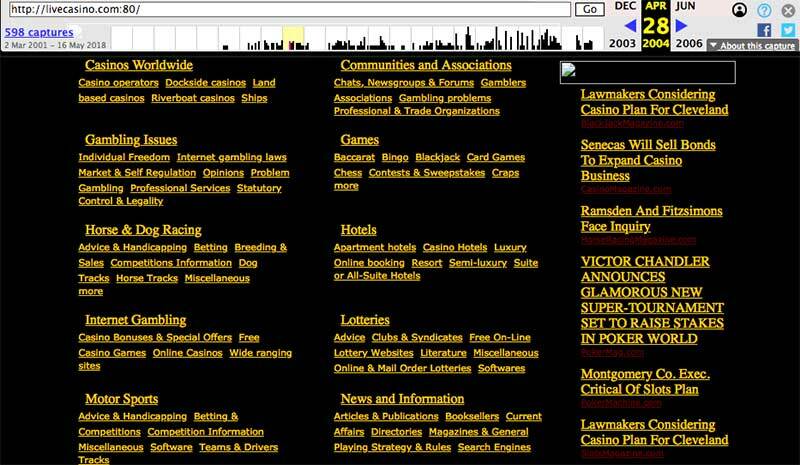 By 2004, the domain got changed to LasVegasCasino.com and now largely functioned as an online casino with its own games that can be downloaded and played on browsers. Like its first iteration, this domain saw some changes again in 2006. This time though, the site’s owners decided to cash in on its traffic and age. As listed on DNPric.es, the domain got sold back in February 2006 for a whopping $10251 through SnapNames. With the sale, the site now changed its domain/redirected to that of Livecasino.com and ditched the casino games. Instead, the website became (and continues to be) an online casino gaming portal that featured online casinos that offered live casino games. As evidenced by the fact that it’s been operating for 12 years now, the domain name change and the shift to reviews and promotions apparently worked. Surprisingly, Livecasino.com isn’t the only domain with the words “live casino” on it that managed to sell for thousands of dollars. Mylivecasino.com and livecasinotv.com sold for $12400 and $12000 back in 2012. Much like LasVegasCasino.com, mylivecasino.com was likely bought to redirect traffic from that domain to another one (in this instance, Supercasino.com). As for livecasinotv.com, the domain continues to look and operate (likely to provide a backlink/s to other domains) in much the same way as it did after it got sold back in September 2012. While these sites managed to get top value when they got sold, others that feature “live casino” on their domain names didn’t fare so well. Most recently (April 2015), livecasino.net sold for only $2219, while livecasino.info for a paltry €750 back in August of 2012. Other than these two, livecasino.us (March 2009) and livecasino.org (February) sold for $650 and €450 respectively. So does the low valuation on these domains mean anything? If these domains were to be sold now, there’d be no doubt that their value would also increase. With the popularity of live casinos these days, top-level domains that feature the “live casino” key words are going to be in demand. Though it’s not the only factor in determining value, a domain’s age is still going to be a plus for webmasters or affiliates. Cases in point would be livecasino.org and livecasino.us. The latter is now valued at $6464 (according to YourWebsiteValue.com) while the former tops out at $6086. Make no mistake, both sites have relatively low traffic but with their age, webmasters can use them to add backlinks for sites they want to rank high on search engine results pages. So if you happen to be a webmaster or affiliate, you might want domains that feature the “live casino” keywords next time you’re checking out Sedo or Godaddy auctions.